In the series of republications of classic Nero albums that Standaard Uitgeverij decided to do, it’s already time for us to review the seventh issue out of the nine that were planned to be released. In this album, Tuizentfloot is introduced, a quite deranged character who believes he is a captain and needs to battle the French with his vessel. He will prove to be quite a lot to handle for Nero and his friends. Nero has a problem, and quite a serious one as well. It’s even life threatening, so something must be done fast. The simple, yet awkward truth is that he swallowed a grenade, which can blow up every second. How exactly he did that, we’ll leave up to you to discover, but fact is that something needs to be done immediately. The doctor doesn’t dare to operate, out of fear Nero will blow up on his operating table, so all he suggests is to stay calm at all times, and sit in the refrigerator several times a day. Nero does his best, but it’s getting harder and harder on him. His wife left to stay with family until it’s safe to come home again, his friends don’t dare to visit him either, and the sessions in the fridge make him so cold that he simply can’t get warm any more. His friend Tuizentfloot offers to take his place in the fridge, but there is a better option: going to the North Pole. Now, his friends seem to have overcome their fear of him exploding, and thus Petoetje, Petatje, Madam Pheip, Meneer Pheip and Tuizentfloot all board the ship. The journey doesn’t prove to be easy though, as Meneer Pheip would much rather go to Nice, and Tuizentfloot keeps thinking they boarded the ship to conquer the French, all while one question still remains: how will Nero ever get rid of the grenade inside of him? After reading the above, the story might come across as silly, and that it sure is. Marc Sleen knows all too well how to shape random occurrences and meetings into a new Nero adventure. The new character, Tuizentfloot, adds a lot to this randomness, as he sees enemies he has to attack everywhere. Even though many story parts are random, it’s still part of Nero’s charm, which is either something you like, or something you don’t. We did like it, even though it could have been a bit shorter. Nonetheless, as it was first published in the newspaper, we can understand why the story would be a bit longer than strictly necessary. Nothing much has changed to the illustrations compared to the previous issue we reviewed, which means the characters still look their own likeable self. The illustrations aren’t that detailed, but for a funny, lighthearted comic book like this, that’s perfectly fine. 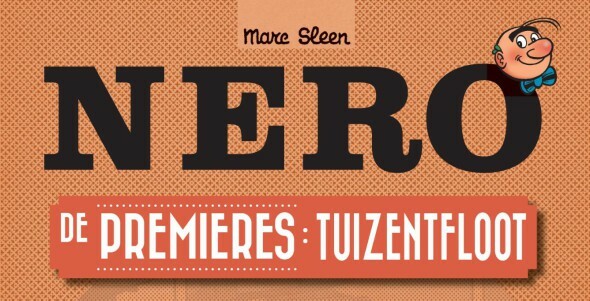 Nero De Premières #7 Tuizentfloot: De Granaatslikker is quite a crazy one in this series of republications. Tuizentfloot adds quite a deranged note to the already silly group of characters. This makes the story rather entertaining, yet maybe not to everyone’s taste, as it’s really quite random. Nonetheless, it’s certainly a nice addition to this series.